Inder Loves Folk Art: A Myrtle Dress and Me-Made-May Part 1. 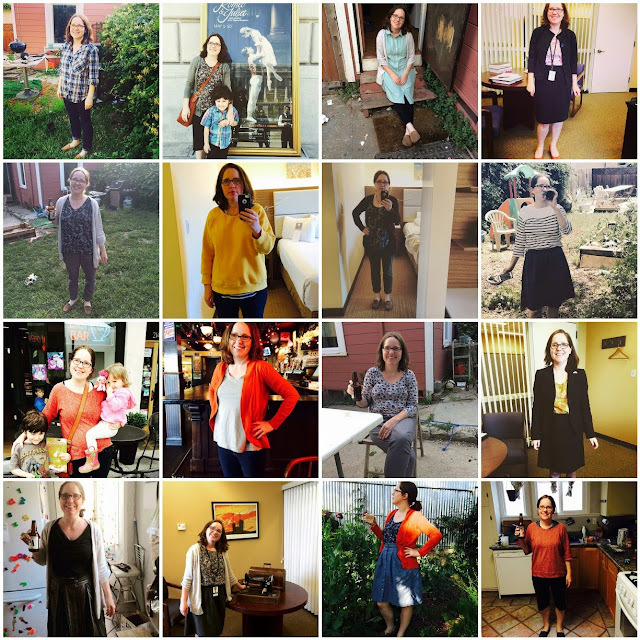 So far, May has been a month of selfish sewing and wearing! Since I'm participating in Me-Made-May, where I wear and photograph something me-made every day of the month, I've been even more motivated to make new things for myself to wear. So far I've made a sweatshirt, a top, and a dress, and I have several more items in the queue. 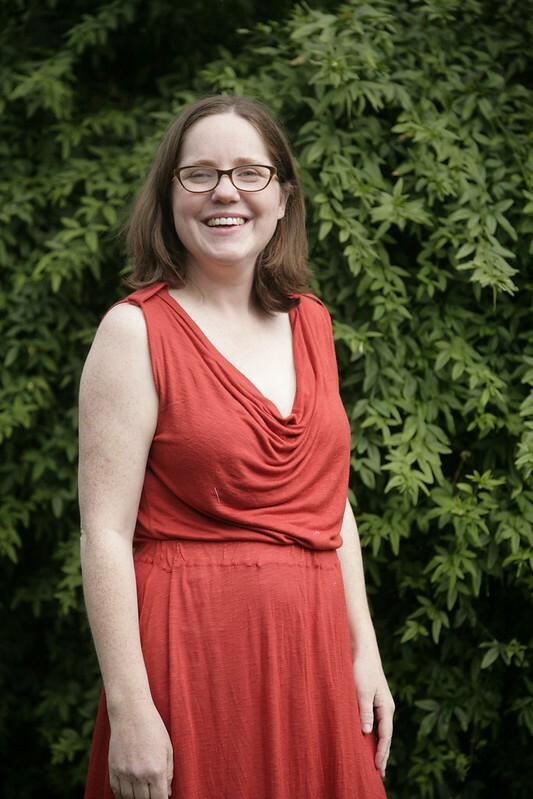 My first item to share is the Colette Myrtle, a knit dress with a cowl neckline. I bought this pattern when it was first released. 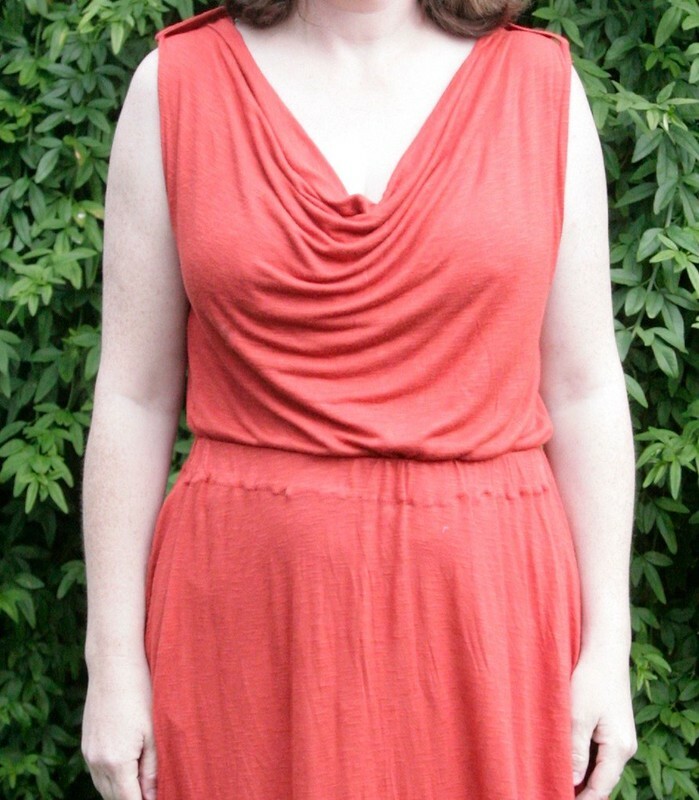 I love knit dresses, and I love cowl necklines, so I was sold immediately. But the pattern didn't get rave reviews - it seems it runs very large and the cowl neckline doesn't sit right on a lot of people. So when I finally got around to making this, I did some research before deciding on a size. Although I measure between sizes Medium and Large according to the pattern, my knit was very soft and slinky and stretchy, so I cut out a size Small. And I'm glad I did! I actually think I could go with an Extra Small in this pattern, at least for the bodice. Which is crazy! (I mean, if I'm an XS, then what are the actually really small people going to wear?) This dress has plenty of ease. 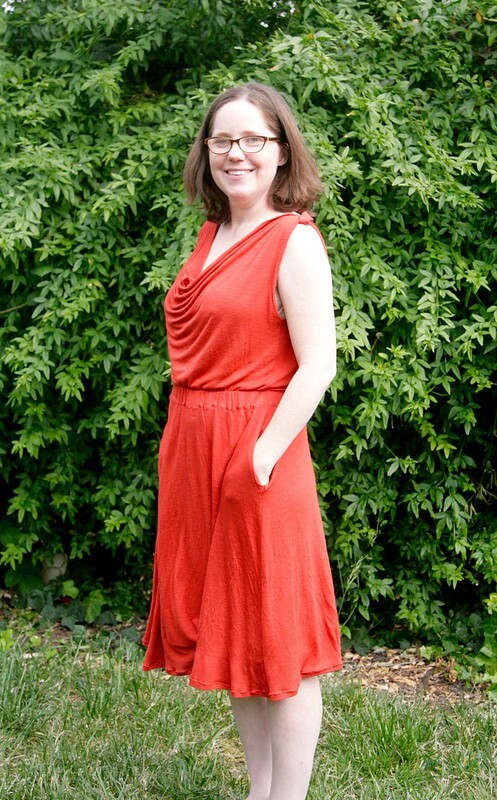 I wish it had a little less fabric in the neckline, honestly, but it does have a very "Grecian Goddess" look, doesn't it? 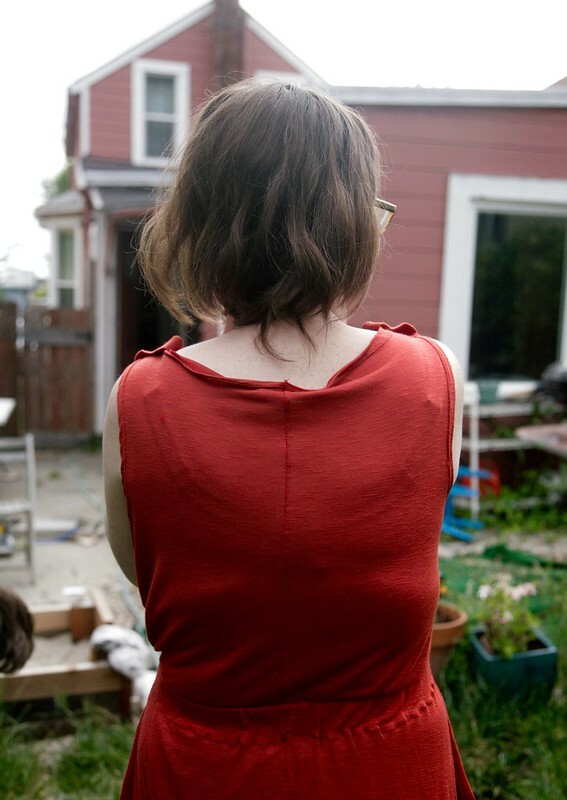 The fabric I used here is a tomato-red slub rayon jersey. It is a lovely color and feels very soft and light, but it was squirrelly to sew. Very tissue fine and prone to getting eaten up by the feed dogs or stretched out. It also shows every lump and bump on the body. Wearing a little half slips helps a lot with that, though. The dress has pockets, which I am on the fence about. Yes, it's fun to have a place to put your hands, but in this lightweight fabric, I feel that they flap around and distort the side seams a little bit. And in such a light fabric, they are not useful for actually holding anything. If I were to make this dress again, I would probably skip the pockets. So that is all the good stuff. Now, onto the ugly: the back. (1) The back bodice is unlined, and the pattern has you turn over and stitch down the neckline and armholes. Well, that might work for a much more stable fabric, but it was a no-go for this light tissue weight jersey. The hems flop all over the place and look super messy. 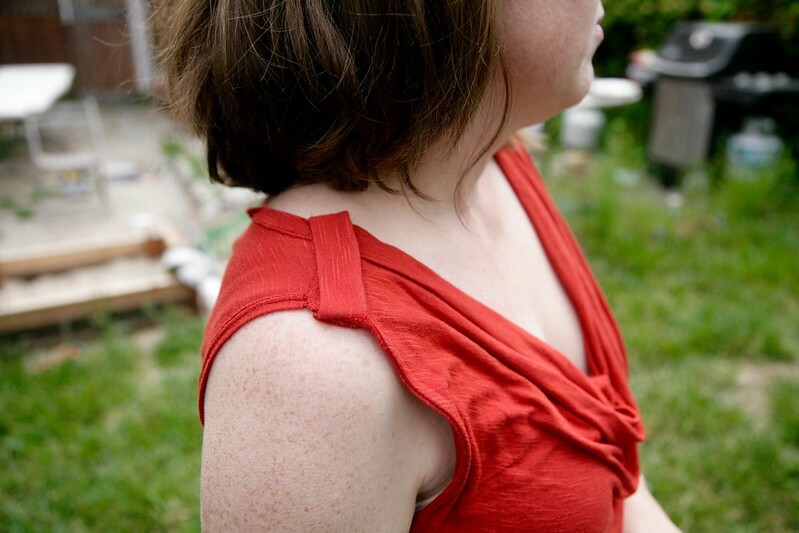 (2) I, like other reviewers of this pattern, felt that the back bodice piece was ENORMOUS. Way too big. Part of the issue may be that I am narrow of back relative to my bust size, but remember, I cut out a size Small, which should have been too small on me (going by the envelope). I feel like something was just wrong with that back piece. I ended up taking it in by well over two inches, creating a seamline down the center-back. This contributed to the general disaster that is the top back neckline of this dress. At this point, I am unclear if it is possible for me to fix this. I think I'll just wear my hair down or a cardigan over it. Okay, take it from me. If you make a Myrtle, check the width of the back piece compared to your body and adjust accordingly. And I would strongly recommend lining the back piece like the front piece. (The way the pattern is constructed would make this very easy, actually. More weirdness happened with the cute little shoulder tab. I honestly cannot figure out where the button is supposed to attach on the tab, and anyway, the tab turned out really long (is the button supposed to attach under the dress? total lack of clarity here). I finally just sewed the tab on. I don't get it. Doesn't matter that much, it's still cute, but ... whaaaaaa? What am I missing? Okay, so that was quite a bit of grousing, I know. When I first finished the dress, I felt pretty frustrated and wondered if I would ever wear it and doubted I would ever try to make it again. Having slept on it and tried it on again, I think I will wear it ... it is a beautiful color, very comfortable, and besides that disaster of a back neckline, looks pretty nice and well made. Perhaps with a few more night's sleep, I'll go back and make a little facing for the back neckline and see if I can improve its appearance. And then the question of whether I will make it again ... I don't know. Maybe? I still really love the cowl neck, and in a more smooth and stable fabric, and knowing what I now know, I think I could make myself a much better fitting Myrtle. I love this style of dress so much and patterns for cowl neck tops and dresses are rare enough that I might just be up for giving it another shot. I do not think I would try this in a woven, though - even in a very drapey light fabric, I think it would just be way too much fabric on my frame! So there's my honest review of the Myrtle: Love the concept of this dress, but this pattern seems much bigger than the measurements indicated on the envelope, and the execution was, frankly, not as straightforward as it could have been. In other news, Me-Made-May!! I haven't had time to do weekly summaries, so here's a mid-month round-up of my Instagram posts so far. Although I committed to wearing me-mades only five days a week, I've actually managed it every day of May so far. I think I had almost forgotten how much of my wardrobe is now handmade. I don't anticipate any problem continuing it for the whole month! From left to right starting at the top left: 1. Grainline Archer, 2. Bess Top and Mabel Skirt 3. Grainline Alder Dress, 4. Josephine Blouse, 5. Briar Top, 6. Upcycled tee and Linden Sweatshirt, 7. Plantain Tank, 8. Breton Top and Everyday Skirt, 9. Unblogged Linden Sweatshirt, 10. Unblogged Short sleeved Plantain Tee, 11. Long sleeved Plantain Tee, 12. Bess Top, 13. Kelly Skirt, 14. Bess Top and Everyday Skirt, 15. Kelly Skirt and Plantain Tank, 16. Unblogged Linden Sweatshirt. Mostly for my own notes, here's what I've learned so far: (1) I have a lot of me-made tops, but you can never have too many! I wear my me-made tops very consistently, with Plantain and Bess being my faves. (2) I make a lot of skirts. I haven't worn all of my me-made skirts yet. I could probably chill out on the skirts. Except the Mabel and Everyday Skirt, that is. I need more comfy elastic-waisted skirts! (3) I don't wear dresses very often but it would be nice to have a few more, especially loose comfy dresses like the Alder dress. (4) Things I love to wear but have not sewn for myself and should: Cardigans and trousers. I am eyeing some of the cute elastic waist trousers out there thinking they might be a good starting point for the ever scary "trouser sewing." Okay, that's it for today! Hopefully I'll be back later this week to blog my new Lisette top and Linden sweatshirt. That really is such a pretty dress-- it's too bad it gave you so much trouble! The only Colette patterns dress I've made was the Laurel and I found that it ran really large, too. I went down 3 sizes in the end. I've got the Hawthorne dress pattern but I haven't ever mustered the energy to do a muslin. Your Me Made May pictures have been great! I am also lacking in pants other than Hudson pants and pajamas. I need to work up the nerve to try jeans! Bummer about the dress! Good luck sorting out the back neckline. It sounds like you know what to do next time, so that's something. Looks like May is going well! Thank you x 1000 for this! I'm planning to make one soon and seeing how I'm normally an XS... I'm going to make a test version of the bodice first! Also I need to try making pants someday soon too... Wait does making leggings count? Damn if that isn't the biggest disaster from behind since the last world cup game Australia played! And it looked so awesome with the cardigan and beer in your me made may photo. Keep it for sure. I wonder if a ribbed half neckband across the back couldn't tame that wonky neck. Problem would be finding a good colour match. 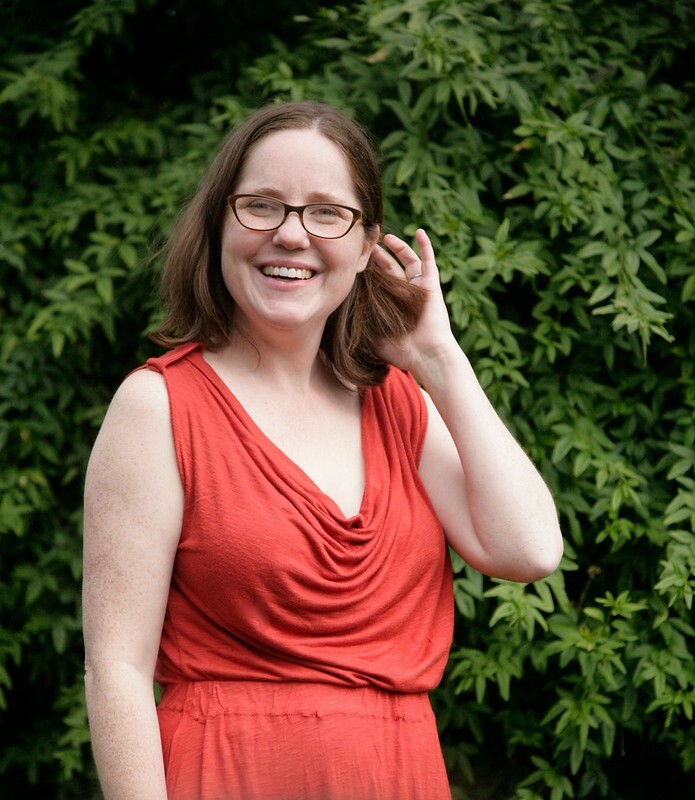 Nicole At Home has published a free cowl neck pattern that I've been meaning to try for ages. You've tempted me cause you look great coming, if not going! Love an honest pattern review too. Kudos to you. Yep, that Myrtle, she's a funny old pattern isn't she? It's so nearly great. But I do like the Grecian goddess look on you. I think it's something you should pursue! You know I think it was actually not Sarai but someone else who designed the Colette knit patterns, which might go some way to explaining the oddness. Way to go with your MMM! I think MMM might finally push me over the edge into getting an Instagram-capable phone. I wanna play properly! I tried to comment last night from my iphone and grrrrrr so frustrating. So, even though I don't really sew for myself, I read every word of this post and was pretty much captivated the whole way through! But I have to tell you - i LOVE your instagram photos. Even more than your blog photos - which I mean in the best way possible because I love your blog photos, too. But I love the way your IG feed captures more of a lifestyle element. Love it. You look so cool with your beer! :) And your personality just really shines. Your Me Made May posts on Instagram have been so fun and inspiring! 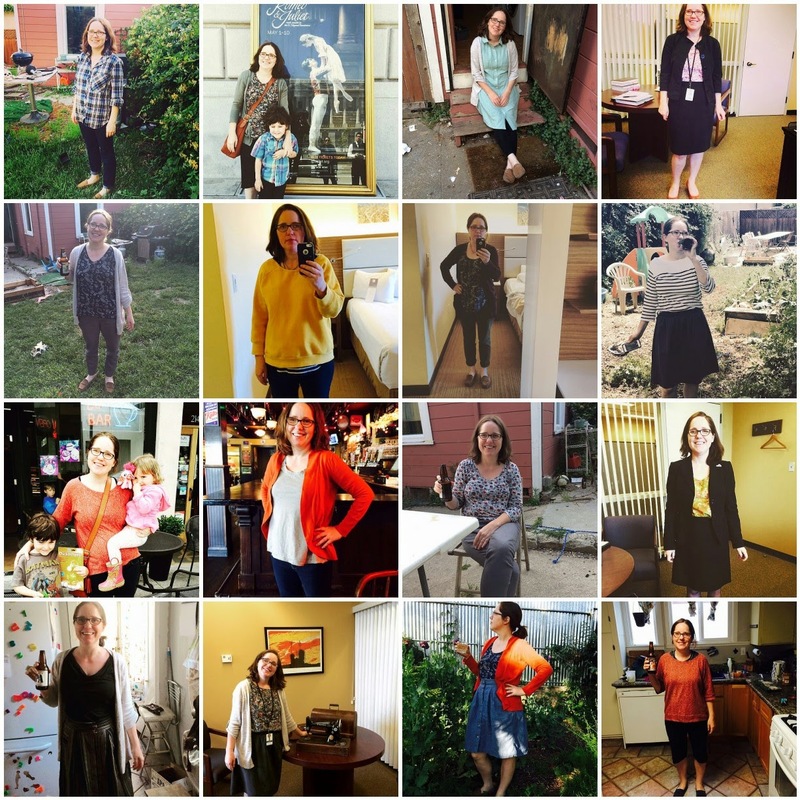 You've sewn such a great wardrobe for yourself and I love to see how you wear the different pieces in everyday life. You are killing MMM! 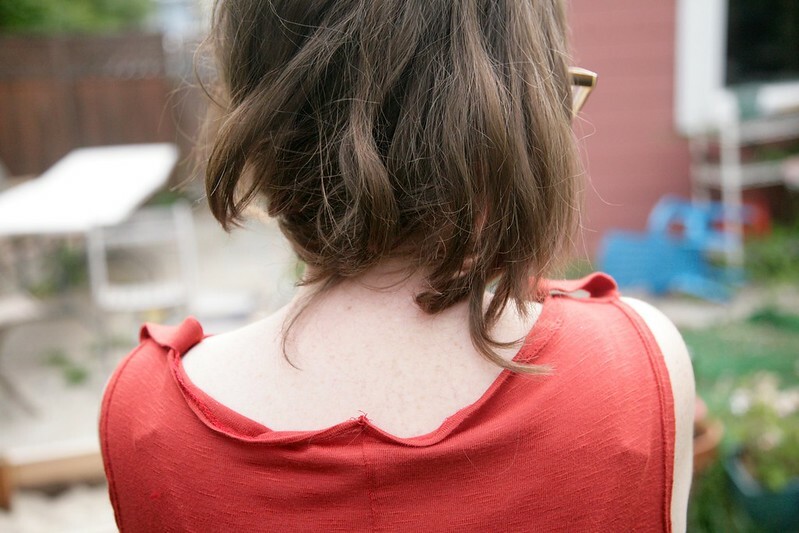 If the back still bugs you, you could always throw on a cardi. Looks Gorgeous. Love the self faced front which gives a lovely clean finish, hiding all the exposed seams.